Hello everyone, today I’m going to show you a quick way to up your breakfast & make your own bacon egg n cheese breakfast cookies! First you will need to cook your bacon & eggs separately. I recommend undercooking your bacon, when you put it in the oven it will finish up nice and crispy. Now roll out your pizza dough and flatten on a non stick cookie pan. Take your cookie cutter and begin to cut sections of your dough. 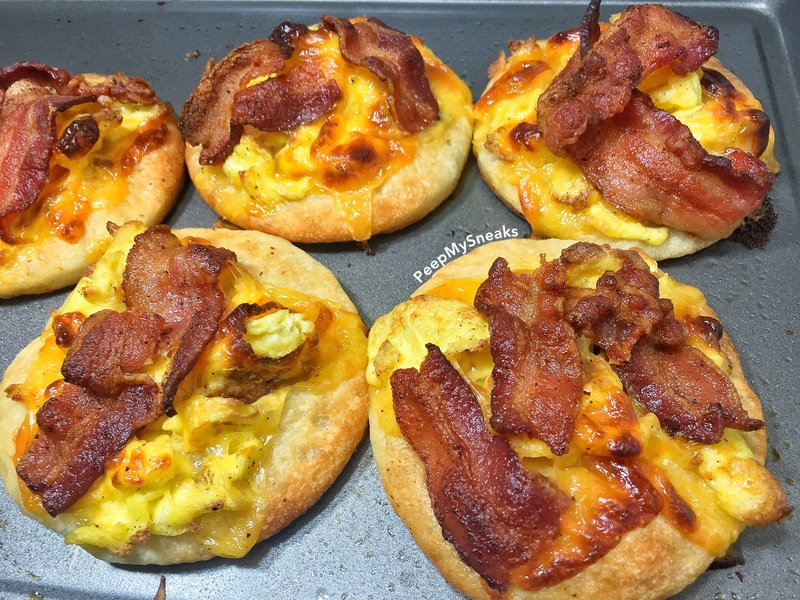 Place slices of cheese, eggs, more cheese and bacon on top. Pre heat oven to 425° and cook for 9-12 minutes, there you have it! Breakfast cookies! Remember to like, comment & subscribe please! Also follow me on Instagram (PeepMySneaks) for more great creations! This recipe will be fun and easy to make.As a addition ingredient i will add a Sausage and Pizza crust top to make a breafast cookie sandwich.